The iGadgitz PT310 Universal Table Top Tripod with Grip is a great accessory for your smartphone. It weighs only 180 grams and its size makes it perfect for travel. 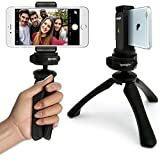 Whether you’re taking a selfie, snapping you and your friends whilst camping or lining up the next landscape whilst walking, you’ll be happy you have this handy little tripod close at hand. With mount: Apple iPhone 6 6S 4.7″ 5 5S 4HD 4S. Without mount: DSLR, SLR, Digital Cameras and camcorders with 1/4″ screw threads. Apple iPhone 6 Plus and 6S Plus 5.5″. This entry was posted in Discount Photography and tagged Adapter, Apple, Black, Grip, Holder, iGadgitz, iPhone, Lightweight, Mini, Mount, PT310, Smartphone, Stabilizer, Tripod, Universal by Ball Photo. Bookmark the permalink.